WAYNE DAVIS expressed his delight at the start Fairfield Villa have made to the new season despite not being able to choose from his “strongest” squad of 16. After taking over the reigns at Villa from the now defunct Sunday side VBG Fairfield, Davis has enjoyed a good start to life in Saturday football. Villa have claimed seven points out of 12 available and progressed into the next rounds of the Les James Challenge Cup and Smedley Crooke Memorial Charity Cup respectively. And their latest victory of the season came in the Smedley Crooke on Saturday when braces from Connor Collins and Stuart Hall guided Villa to a 4-1 victory at Sutton United – the perfect response to the agonising last-minute 3-2 defeat to rivals Droitwich Spa on Bank Holiday Monday. Even though Davis has been pleased with the start the new-look Villa have made, he told the Standard it’s even more pleasing because he’s yet to try out a full-strength squad. “The lads were disappointed with the defeat at Droitwich and I asked them for a reaction at Sutton and they did exactly that,” he said. “We were 2-0 up at half-time at Sutton but I reminded the players we lost to Droitwich from that position the other week. 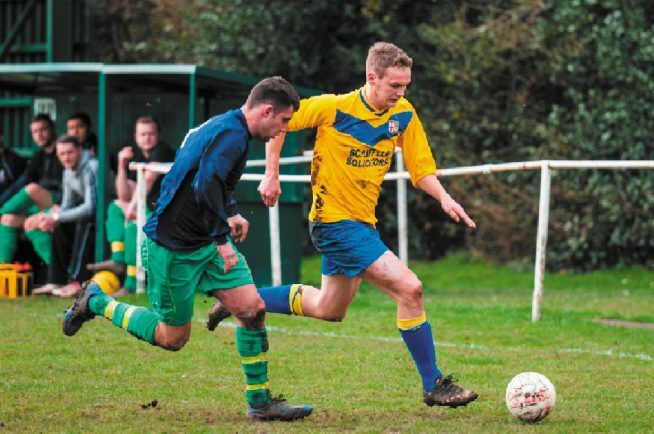 “But fair play to the lads as they learned from the mistakes we made at Droitwich and progressed into the next round of the cup. “I’m pleased with how we’ve started the season but it’s even better for me because I’m yet to pick from my strongest 16 players. Villa return to league action on Saturday when they welcome Paget Rangers to the Recreation Ground. Ryan Molesworth, Ben Smith and Daniel Price are missing but Omar Salih returns. “If we can cut out the silly mistakes I can’t see any reason why we won’t be challenging the top six,” Davis added.